The Easy Kleen Portable Skid Unit is a totally self-contained system that allows for 100% portable cleaning. This series of hot water pressure washers was designed to be truck or trailer mounted for mobile washing purposes. These units are ideal for use within municipal, mining, oil field, forestry and industrial cleaning operations. 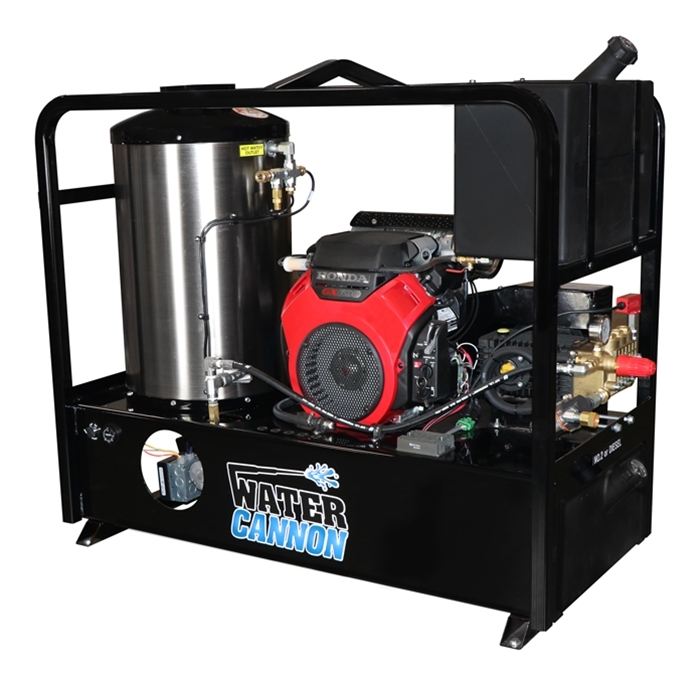 These units can also be mounted on a skid frame in combination with 225, 550 or 630 gallon water tanks and a variety of hose reel and accessory options to create a totally customizable self-contained Key-Start system. Our customers continuously comment on the heat and speed of cleaning with these machines. Enjoy the power of a 150-degree F temperature rise. Sealed with Ceramic Blanket and enclosed in a stainless-steel housing for heating efficiency. These coils have been specially designed to be paired with the burners maximum heating and fuel efficiency. The coils are securely mounted to the frames to reduce vibration and enhance ease of maintenance. Quality North American made oil fired burners with adjustable thermostats are used due to their efficiency and durability. Safety features include: flow switch, pressure switch, rupture disc, high limit and adjustable thermostat.